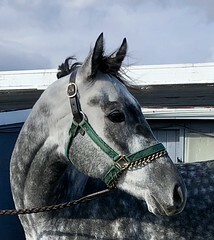 Fans of Frost Giant offspring, and of gorgeous dappled greys, this boy is for you! 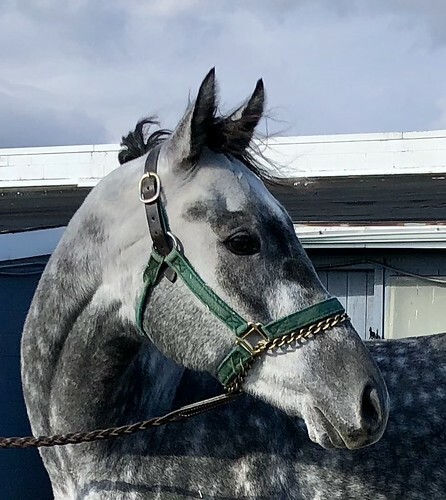 He is a homebred, so you will be able to get his entire history from his owner/trainer. 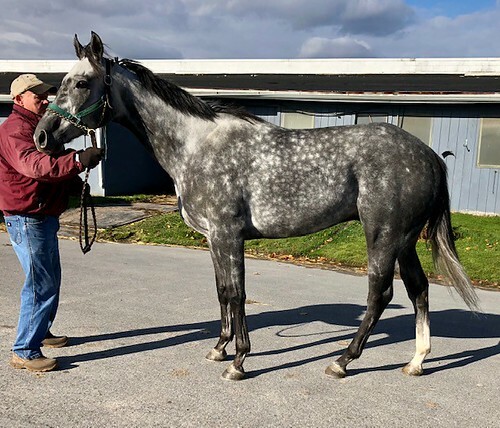 His trainer says he is very sound, and his legs are indeed very clean, and he has no vices. 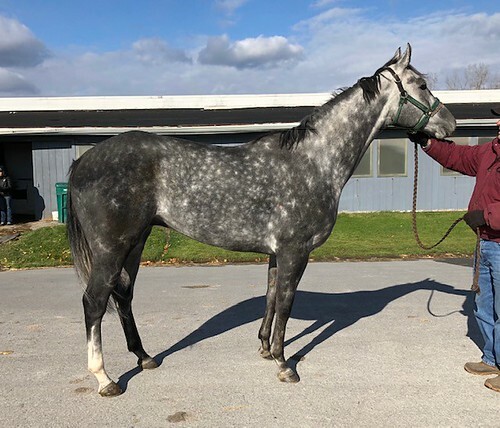 King’s Stage has had only 4 starts, and it is obvious that he is not going to cut it as a racehorse, so his owner wants to find a great new home where he can excel in a new career. 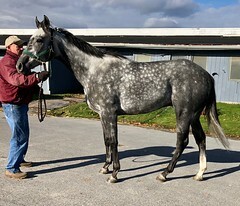 The trainer says that normally in the mornings King’s Stage is “like a track pony” he is so sensible and well behaved. On the afternoon that we photographed him, he was understandably feeling his oats a bit, since he had raced three days ago, had done nothing but walk inside the barn in the meantime, and was brought out into gusting winds and zero degree wind chills. But he handled himself well, standing attentively for his photos and respecting his handler for the jog on icy ground. While the conditions did not permit him to trot out, we could see that he is a very good mover, with a fancy toe flicking trot. He is by Frost Giant, who is a son of Giant’s Causeway. This is a line known for producing good jumpers with a lot of heart. 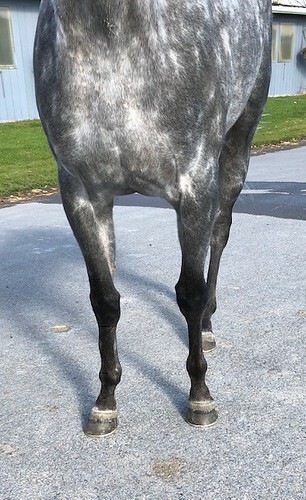 And his dam is by Rizzi, who is from Sir Ivor and Damascus lines. Pleasant Colony and Spectacular Bid are other notable sport oriented lines in his female family. For those of you who do not need huge, and are looking for an outstanding prospect for the hunter/jumpers, for dressage, or for eventing,or any other sport, King’s Stage is a great prospect.